Well.ca has a Victoria Day Flash sale on now! 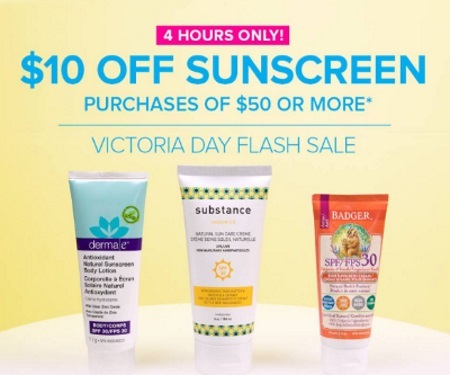 Save $10 off sunscreen purchases of 450 or more! Enter the promo code SUNSALE2017 at checkout to get the discount. Coupon offer ends May 21, 2017 at 11:59 p.m. EST. Coupon allows user $10 off orders of a purchase of $50 or more before tax. Coupons are only valid on sunscreens excluding Green Beaver. Limit one offer/coupon per household.